MicroFingers technology produces smooth, flawless results! Surbuf R Series 4 Inch Buffing Pads are a new spin on foam pads. Every Surbuf pad is covered in MicroFingers, tiny vertical fibers that adjust to compensate for all the peaks and valleys of the paint finish. The result is a deeper, more uniform gloss over the entire vehicle. Surbuf R Series 4 Inch Buffing Pads are perfect for detail work and spot polishing. 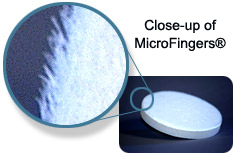 MicoFingers are independent, non-tufted vertical fibers that move and bend a lot like your fingers. As the pad moves over the paint, the fingers stiffen and flex according to the lay of the paint. It adjusts to the surface so you achieve uniform results. With flat pads, you have one large point of contact with the paint. With Surbuf pads with MicroFingers, the paint is being polished at multiple points of contact, resulting in a deep shine. Surbuf R Series 4 Inch Buffing Pads look similar to wool pads, but that's where the similarities stop. The MicroFingers are unlike wool in the fact that the MicroFingers resist bending and matting. Because the MicroFingers remain separated, less heat builds up, which protects clear coat finishes from burning. Plus, MicroFingers trap and hold finishing agents close to the surface as the Surbuf R Series 4 Inch Buffing Pad oscillates. The pad keeps the polish on the work surface, rather than soaking it up, which results in more effective swirl removal and polishing. Product waste is reduced. It takes half as much product on a Surbuf pad to accomplish the same results as other types of pads. MicroFingers are attached to a flexible base that follows the contours of your vehicle. Surbuf R Series 4 Inch Buffing Pads have hook and loop fasteners from edge to edge to provide a secure hold on the backing plate. Surbuf R Series 4 Inch Buffing Pads glide over the paint without snagging, skipping or chattering. Operate them at full speed on a random orbital or dual action polisher. The pads always produce a consistent finish. Unlike other pad systems that offer various "cuts", Surbuf R Series 4 Inch Buffing Pads are suitable for any polishing or waxing application. The Surbuf pad provides a safe, nonabrasive applicator that allows the product to work as intended. If you're used to multiple pads, you'll need to experiment to find the right speed and length of time to work in a polish or cleaner. Follow the product manufacturers' instructions. Once you get the hang of it, Surbuf R Series 4 Inch Buffing Pads just might replace all your polishing and finishing pads! Surbuf R Series 4 Inch Buffing Pads are designed specifically for random orbital and dual action polishers. Use a 3.5 Inch Dual Action Flexible Backing Plate. Let your MicroFingers do the polishing! Surbuf R Series 4 Inch Buffing Pads adjust to the paint finish to deliver smooth, consistent results and a perfect shine every time. Surbuf pads eliminate swirl marks. MicroFingers® resist bending and matting to allow cooler, non-burning surface temperatures, which helps protect clear coat finishes. Slim profile easily conforms to different surface contours for maximum coverage and efficiency. Surbuf pads allow for a wide range of operating speeds up to 12,000 opm on ANY solid surface without snagging while reducing the risk of damage to pin striping, decals, and wood tear-out. It also minimizes friction, skipping, and chattering. Hook-and-loop fastening system makes changing pads quick and easy. Edge-to-edge loop fastening accepts various sizes of backing plates providing full hook-to-loop engagement for maximum holding strength and added peripheral edge stability. Low-pad absorption helps make cleaning and polishing products last longer. Surbuf pads can be cleaned easily by hand for on-the-go operations using a comb or soft brush. Best pads for final polish, wax and buff ! I purchased a couple 2 packs of the 4" size to try out. Much better than the microfiber pads I have used for final polish using a micro scratch polish / glaze for dark cars. In fact it is the best thing for a darker finished car as every imperfection shows. I will be using on light color cars too just won't be able the see the improvement. Really like for wax application and removal/polish universally. Nothing better. I have not tried with correcting compound nor try for compounding. Would be interesting to see other reviews, on those aspects. I have a lot of different pads, but I like Surbufs because I can use something like Meguiar's 105 for aggressive polishing, but I can finesse edges and contours with low pressure. Finer polishes and pads use less pressure anyway, so aggressive polishing is where this really helps out. ProsEasy to use with low pressure, works fast, leaves a pretty good finish from Meguiar's 105.